PURCHASE RADHE RADHE: RITES OF HOLI ON DVD NOW FROM AMAZON. PURCHASE RADHE RADHE: RITES OF HOLI ON BLU-RAY NOW FROM AMAZON. 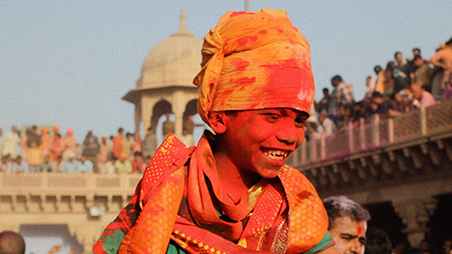 Holi is known around the world as a joyful, chaotic and colorful celebration of springtime in India. In response to Stravinsky’s own famously chaotic work about springtime, pianist and composer, Vijay Iyer, and filmmaker/ collaborator, the late Prashant Bhargava, were intrigued by the possible connection with Holi. This festival provides an occasion to reconsider the aspects of ritual and transformation represented in Le Sacré du Printemps. RADHE RADHE: Rites of Holi is a journey of devotion for the goddess Radha. In this project, Iyer and Bhargava answer back to the Sacré score and ballet with a new work for chamber ensemble and film. International Contemporary Ensembleperform a suite for three winds, three strings, two percussion, two pianos, and electronics, in live counterpoint with cinematic episodes compiled from footage of the eight days and nights of Holi festivities in Mathura, India. The result is also a ballet of sorts: a performative encounter between live music and film, between lived experience and myth, the self and the transformed self, winter and spring. Commissioned by Carolina Performing Arts as part of their 100 year anniversary celebration of Stravinsky’s ‘The Rite of Spring’, ‘Radhe Radhe’ was composed by Vijay Iyer, with film by Prashant Bhargava. The world premiere was performed on March 26, 2013 at Memorial Hall, Chapel Hill, NC. Iyer’s dear friend and collaborator Bhargava passed away suddenly in 2015. Radhe Radhe was his last major work and these performances are dedicated to his memory.